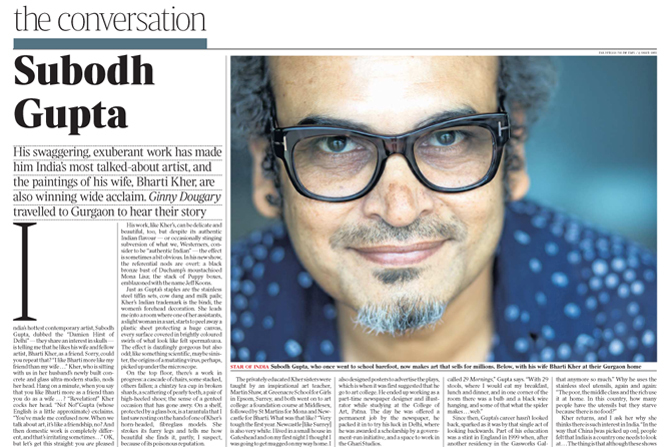 In July I was commissioned to take photographs of artist Subodh Gupta for a profile that was published in last Saturday’s Review section of the London Times (see above). In the past twelve months I have been approached by three publications: America’s Art&Auction, the German ART Magazine and now The Times to illustrate features on the theme of Indian contemporary art. This alone is some measure of the recent international recognition bestowed upon Indian artists including Gupta who I have now photographed on two occasions. 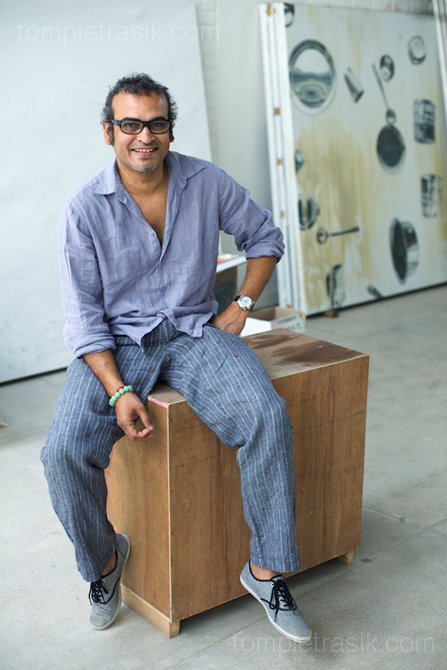 You can see my story on Indian art curators, commissioned by Art&Auction, on my website here. Those that know about art will appreciate the significance of Subodh Gupta and particularly his contribution to contemporary sculpture. Gupta was brought up, one of six children, to a railway-worker father in a north Indian village so his modest roots stand in stark contrast to the decadent lives of the investors that now flock to his shows. 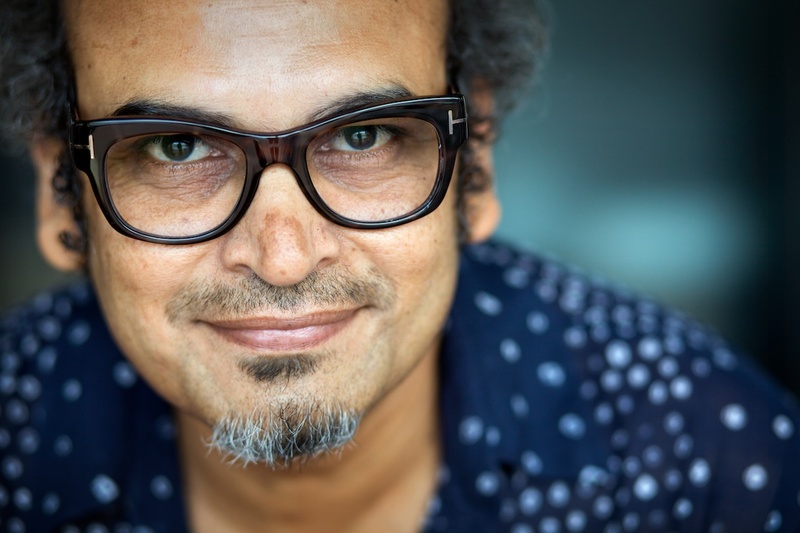 Given the scale of his success – and despite a propensity for wearing ostentatious glasses – I have been reassured to find Gupta a modest and unassuming man on the occasions we have met in his Gurgaon studio on the outskirts of Delhi. I can only assume that a childhood spent without wearing shoes and a long apprenticeship that included a stint as a newspaper illustrator together with five years acting in a regional theatre group have provided the artist a steady grounding. 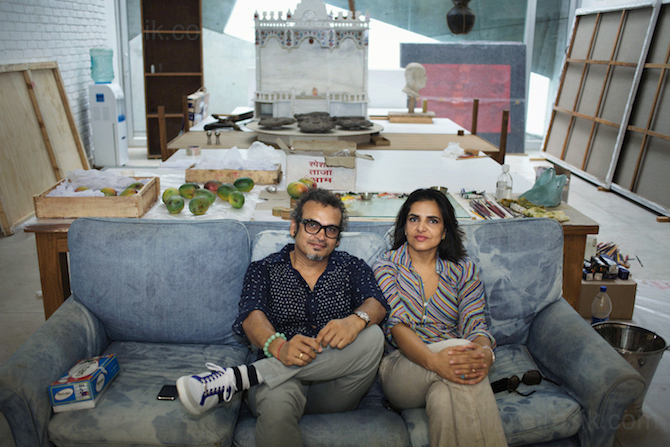 Subodh Gupta and his artist wife Bharti Kher in his Gurgaon studio. This comment takes on a deeper resonance when you realise that Gupta’s work fetches such huge sums of money. Two versions of his Mind Shut Down, modeled on the human skull and constructed entirely of steel kitchen utensils recently sold for €1 million each. Of Gupta’s many wealthy patrons, François Pinault, who bought the artist’s Very Hungry God, is worth US$16.9 billion. It is a sorry commentary on our world to discover that Pinault’s fortune is greater than the entire annual wealth of Gupta’s home-state of Bihar (US$15.5 billion) with a population of 83 million people. It would be entirely wrong of course to suggest that Gupta’s work helps us comprehend this injustice. But he is certainly one of those individuals whose life, work and success are framed by the disparity of our globalized economy. Its good of you to post this article on your blog… enjoyed reading it. There was this huge escalation in his prices and then there was a sudden slump..
Subodh Gupta is literally monotonous. Once an artist sells everybody starts singing hymns to him. It speaks volumes on the contemporary art market when you see mediocrity celebrated. Bharti Kher is even more mundane but look at the prices. Her claim to fame : a new medium of expression : the Indian Bindi. How ridiculous ! Anybody who knows the art market will tell you how the internals of this narrow and clique ridden market work. 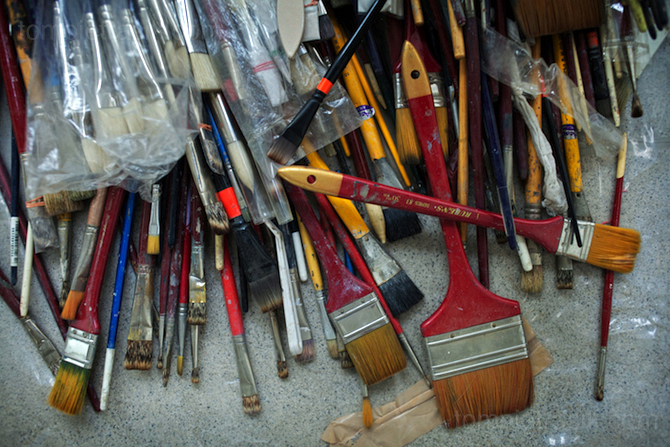 The test of art, any art, is in longivity, not temporary name and fame..